› Author Affiliations Funding This study was supported in part by The Wellcome Trust in equipment and strategic award (Synaptopathies) funding (WT093205 MA and WT104033AIA). Mutations in KAT6A encoding a histone acetyltransferase involved in chromatin remodeling and in other genes involved in histone acetylation and/or deacetylation have been implicated in broad phenotypes of congenital and developmental abnormalities. However, limited genotype–phenotype correlations are available for some of the most rare or recently reported genetic disorders related to chromatin dysregulation. 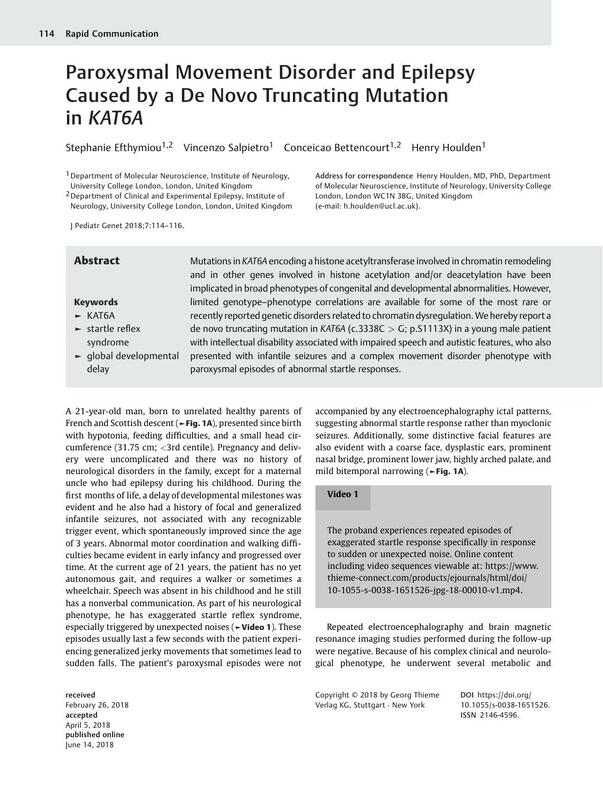 We hereby report a de novo truncating mutation in KAT6A (c.3338C > G; p.S1113X) in a young male patient with intellectual disability associated with impaired speech and autistic features, who also presented with infantile seizures and a complex movement disorder phenotype with paroxysmal episodes of abnormal startle responses. We confirm that we have read the Journal's position on issues involved in ethical publication and affirm that this report is consistent with those guidelines. Stephanie Efthymiou: study design and experimental data acquisition, analysis and interpretation of data. Dr. Vincenzo Salpietro: study concept and clinical data contribution to the manuscript, analysis and interpretation of data. Dr. Conceicao Bettencourt: critical revision of the manuscript document. Prof. Henry Houlden: study supervision.